Image caption US Speaker Nancy Pelosi told Irish politicians the Good Friday Agreement was "not just a treaty" but "also an idea"
US Speaker of the House Nancy Pelosi told Irish politicians the Good Friday Agreement is a "beacon to the world". 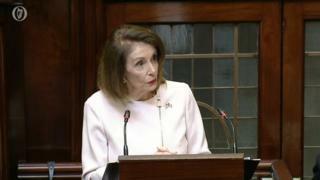 Speaking in the chamber of the Dáil (Irish parliament), Mrs Pelosi repeated the warning there was "no chance" of a post-Brexit US-UK trade deal if it was compromised. "We must ensure that nothing happens in the Brexit discussions that imperils the Good Friday accord," she said. "Including but not limited to, the seamless border." She will be in Northern Ireland on Thursday as part of her visit. Mrs Pelosi had previously warned about the danger to a US-UK trade deal when she spoke in London on Tuesday ahead of her visit to Ireland. Image caption US Speaker Nancy Pelosi told the Dáil the Good Friday Agreement was a "beacon to the world"
On Wednesday, Ms Pelosi told a joint sitting of the Oireachtas (Irish houses of parliament) "we treasure the Good Friday accord". She said: "On that holy day the world saw the dawn of peace in Northern Ireland that few had dared to dream." As speaker, Ms Pelosi is the third-most senior politician in the United States after the president and the vice-president. She was making the address as part of centenary celebrations for the Dáil. In attendance in the public gallery was U2's lead singer Bono, who she praised for his music and advocacy work. Mrs Pelosi said she was deeply honoured by her welcome to Ireland, "a beautiful and magical land". She recalled the visit of President John F. Kennedy, who told the Dáil that while Ireland and the United States were divided by distance, they were united in history. Mrs Pelosi said both Ireland and the US "know the joy of independence" and both "endured the traumatic experience of civil war and the satisfaction of rebuilding our nations". Mrs Pelosi is in Ireland as part of a delegation of Democrat and Republican congressmen and women.